We are staying in a cabin at the moment, courtesy of RACV Total Care, while the van is being repaired. RACV pay for our accommodation, if we have a breakdown with the car or van, provided the car that is covered is towing the van that has broken down. The heating element of the hot water service had burnt out on about day 2 of the trip. No holiday is complete without a problem with the Kimberley, Russ had already replaced the 7 pin connector on the van as the brakes were not working properly. Maybe we should thank Kimberley for adding interest to out travels! We were a little apprehensive about how we would be received at Kimberley, but they couldn’t have been more accommodating. We had a list of 7 things to be repaired, but they have volunteered to give it a complete looking over and replace tired rubber seals, fit a new model van pressurisation system (to keep dust out), etc. Yesterday, being without the van, we spent the day on the road, first breakfasting at Shelley Beach cafe, right on the edge of the beach, overlooking the beautiful surf beach, a pod of dolphins swam passed adding to our enjoyment. They rode a wave for a short time and then one casually jumped out of the water off the top of the wave. 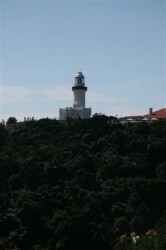 Then off to Byron Bay and Cape Byron, the most easterly point on the Australian mainland, followed by a delicious Japanese meal for lunch, back at Ballina. Russ reckons that I have an uncanny knack of being able to find a Japanese restaurant if there is one within 50 Km! 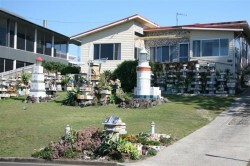 On the way to visit Cape Byron we passed this house, a strange passion indeed, and the backyard is the same! Great to hear from you last night and really pleased to hear how relaxed you sounded. Nothing like a new Labour govt to put a spring in your step 🙂 Enjoy the rest of your travels and we look forward to seeing you on cup weekend.